Ideal for garden use with the Kärcher garden watering system, this Kärcher tap connector is ideal for connecting to all Kärcher garden pumps. This threaded tap connector is also compatible with all click systems. Reliable thread reducers and tap connectors are essential as part of an efficient watering system. Kärcher’s range of connectors are perfect for connecting, disconnecting and repairing watering systems, like the Kärcher Rain System. This 1” tap connector with thread reducer allows for connection to two thread sizes, and has been designed to fit all standard garden hoses. Ergonomically designed for easy handling, this tap connector is the ideal solution for connecting or repairing two hoses. 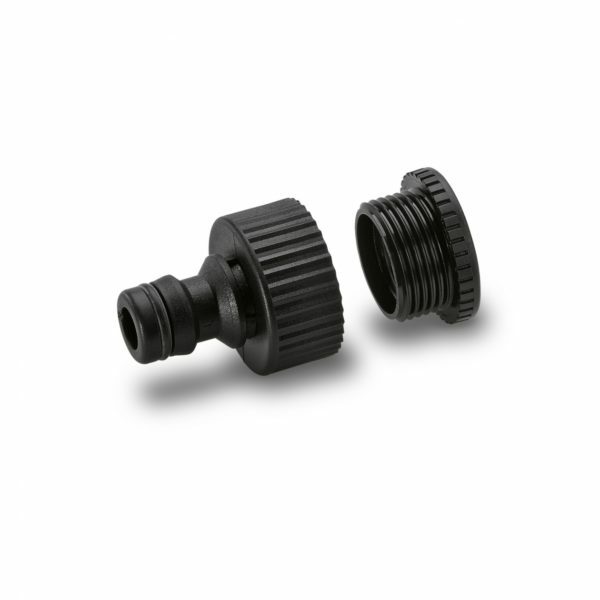 Applications for the 1” Tap Connector with ¾” Thread Reducer This Kärcher tap connector can be used on hoses for watering small to large areas and gardens, as well as ornamental, small bed, potted, food and individual plants. This connector can also be used on hoses used to clean gardening tools and garden furniture.